Synopsis: In a single week, Elijah Alexander has gone from being a famous and successful ADA in New York, to a hunted, haunted renegade on a mission of vengeance. Because Elijah is the last of a race of ancient warriors called the Mantamaji who once fought the world's greatest evils. And now the only one with the power to get it done-- because it takes a warrior to kill a mystical being. Or four of them. I came across the Legend of the Mantamaji website because I was adding publisher data to one of the comic book wiki's and stumbled across a request for reviewers. I looked at the artwork, read the synopsis and then immediately decided to send a request to do a review which was accepted. A package was delivered to my doorstep just five days later, which is incredibly fast for an international delivery from across the ocean. The package contained all three books in the trilogy and were wrapped very nicely in a plastic bubble mail envelope protecting it from damage and rain. Very fast international service from the people at And... Action Entertainment. Slightly thinner than Book One (about 30 pages) and made by the same Korean printer. Again, like the first book, they've done a very professional job with respect to the deep saturated colors. The shiny interior and thicker matte cover paper used displays the artwork with deep and vibrant colors. The pages in my copy have all been cut straight and are kept together with perfect binding. I have now read Book Two several times and it still holds every page together like you'd expect. I like the UV spot coated logo on the cover. Spot coating always makes me want to touch and feel it, but perhaps that's just my personal fetish. The story at the end of Book One left us with a big cliffhanger. This second volume makes us reconsider everything we learned in the last few pages of the first book. I was kept wondering if it was a double bluff, or a triple, or something else entirely. Elijah is out for revenge and because of that he doesn't always make the right decisions. Will he falter, give in to Brother Hope and lose sight of his true purpose in order to get back what he lost? Again I have to say Seaton has done a wonderful job writing this story. It's obviously his baby and he's nurtured it into this mature story which makes sense every which way you turn it. I like Palas' full page panels best. He really makes all the characters shine when he has the space to draw them whole. His realistic art and leaving out of everything which clutters up the background makes for a fast read. There are a lot of battles in this second volume and he has no trouble with the anatomy of them. Especially the Four Horsemen in all their ancient glory are no match for Palas' skills on the drawing board. A special mention to Andrew Dalhouse who has once again done an outstanding job with regards to the colors. Whether a character is sitting on the couch or in an all-out battle Dalhouse finds the right color scheme that suits the scene. I also admire the way he colors fire, which in my opinion is one of the hardest things to do. Just like the first book I want to continue reading and I almost did, but decided I didn't want the last book of the trilogy to cloud my judgment of Book Two so I regretfully put it aside, but not out of reach. So far this series is living up to it's expectations and that's mostly to do with Seatons excellent writing. Right now the creative team behind the series is working on a live action short. I for one can't wait, especially knowing the level of experience Seaton has with TV productions. Here's the short teaser. You can find more videos on the Mantamaji on YouTube. 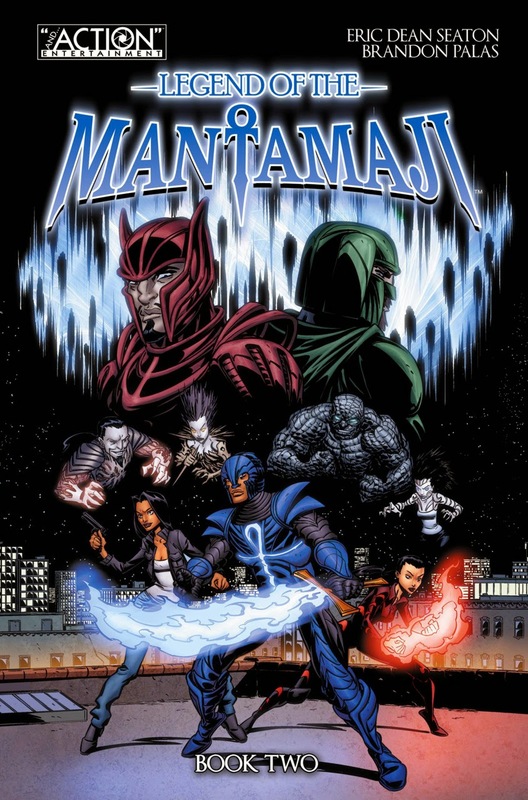 Some small press graphic novels can be difficult to get your hands on, but not the Mantamaji. You can get a digital or hard copy straight from the source at the Legend of the Mantamaji website store or from any of the big sellers like Comixology (digital only), Amazon USA and UK (digital and hard copy) and Barnes & Noble (hard copy), among many others. Check your local comic book store because they can order it through Preview from Diamond Distributors. If you're going to order please don't forget to check the Mantamaji website store first because they often have package deals and/or creator autograph deals. If your local comic book sells this series let me know and I'll post a link here.